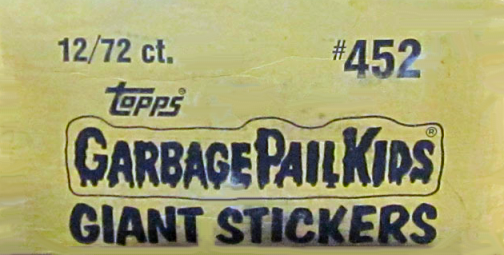 A second Garbage Pail Kids Giant Stickers set was released by Topps in May of 1986 with the due date of February. Additional sets were requested by upper management to capitalize on the successful sales of the cards during the hype of the parody card craze; including the Giant 1st Series and GPK Poster sets. The set was released after the OS3 Garbage Pail Kids set that was released in January of that year and during the OS4 Garbage Pail Kids set which was released in May of 1986. 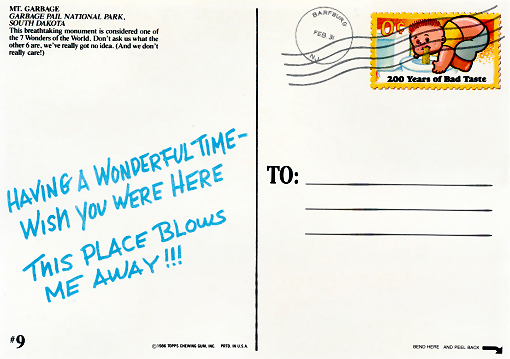 The fifteen card set contained original GPK artwork, including several previously unpublished pieces, that were poster-like in image and measuring slightly smaller than 5x7 inches. Each pack cost 99¢ and came with '3 Giant Stickers' with award backs. The same set was released in the UK with different copyright information. 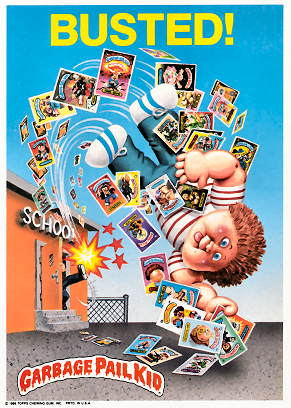 An 18-card 2nd Series Giant GPK set was planned, but it became the GPK Poster set instead. CASE BOX : 12/72 ct. PRODUCT #452 : UPC ? 1. Card artwork #2 'Bony JOANIE ... Thin LYNN' by Tom Bunk is the only card with an actual PEEL HERE Arrow on the card front due to the theme of the joke. All fifteen cards have a 'BEND HERE AND PEEL BACK' arrow on the backside of the cards in the lower right hand corner instead. 2. 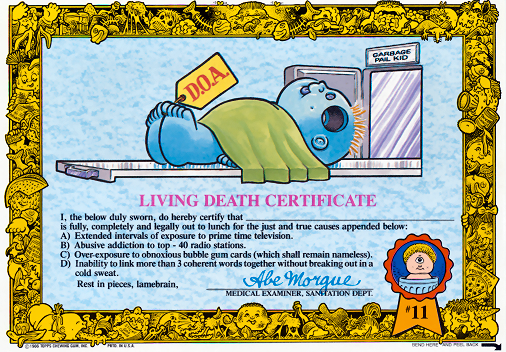 Card back #11 'Living Deatch Certificate' can be found within the Giant 1st Series set found on the card back for #30 New Wave DAVE due to a Production Anomoly. 3. The image for 5x7 card #14 BUSTED! 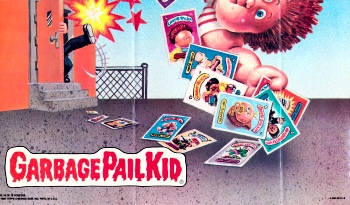 from the Garbage Pail Kids Giant Sticker set painted by artist John Pound is used for the OS5 through OS8 Retail Ad Posters with an enlarged, straight GPK banner at the bottom. The image can also be found on the #18 BUSTED! from the 12x17 GPK Poster set with the new straight GPK banner rather than the original, curved GPK header. 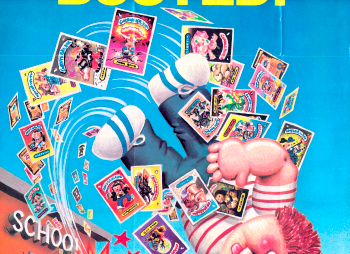 The original poster contains a much smaller GPK banner. In both the posters and card, along with various award and license card backs, there are several OS1 and OS2 characters found throughout the image. As can be discerned from L-R from the 'SCHOOL' sign to the ground: 45a Leaky Lindsay and 45b Messy TESSIE, 27a Brainy JANIE and 27b JENNY Genius, 49a Double Heather, 49b Schizo FRAN/FRAN FRAN, 30a New Wave DAVE and 30b Graffiti PETEY, 8a ADAM Bomb and 8b Blasted BILLY, 73a Gorgeous GEORGE and 73b Dollar BILL, 3a Up CHUCK and 3b Heavin' STEVEN, 83a Ugh LEE and 83b Sumo SID, 77a Ghastley ASHLEY and 77b Acne AMY, 54a Fryin' RYAN and 54b Charred CHAD, 79a Sewer SUE and 79b MICHELLE Muck, 74a MARK Bark and 74b Kennel KENNY, 57a TOMMY Gun and 57b Dead FRED, 67a Phony LISA and 67b MONA Loser, 43a Smelly KELLY and 43b DOUG Plug, 44a SY CLOPS and 44b One-Eyed JACK, 66a MATT Ratt and 66b RACHEL Rodent, 62a Greaser GREG and 62b CHRIS Hiss, 5a Dead TED and 5b JAY Decay, 65a Shrunken ED and 65b Cheeky CHARLES, 42a PATTY Putty and 42b Muggin' MEGAN, 18a Cranky FRANKIE and 18b Bad BRAD, 75a Off-The-Wall PAUL and 75b ZACH Plaque, 46a Rappin' RON and 46b RAY Gun, 4a Fryin' BRIAN and 4b Electric BILL, 39a Buggy BETTY and 39b Green JEAN, 41a Mean GENE and 41b Joltin' JOE, and 40a Unstitched MITCH and 40b Damaged DON. 4. The two previous GPK Characters in card #15 'GARBAGE PAIL SCHOOL' are OS1 card characters 30a New Wave DAVE and 30b Graffiti PETEY and 5a Dead TED and 5b JAY Decay. The character blowing a chewing gum bubble is holding three indestinguishable GPK cards. 5. 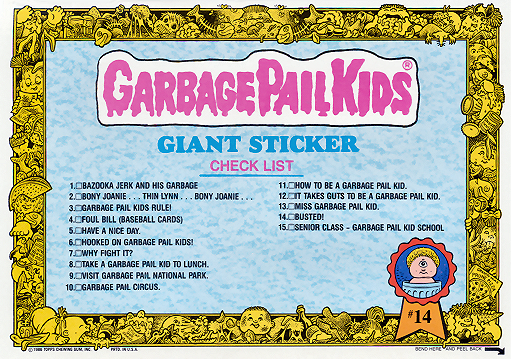 The reverse card back for #9 'GARBAGE PAIL NATIONAL PARK' is the only Giant Sticker card back with no border or ribbon artwork as seen on the other forteen cards; it is made to look like the back of an actual Postcard. The postmark is from 'Barfburg' NJ with the date Feb 31st, the sets due date month for Topps, but with a bogus calendar date. 6. The Checklist is located on the reverse back of Card #14 'BUSTED! 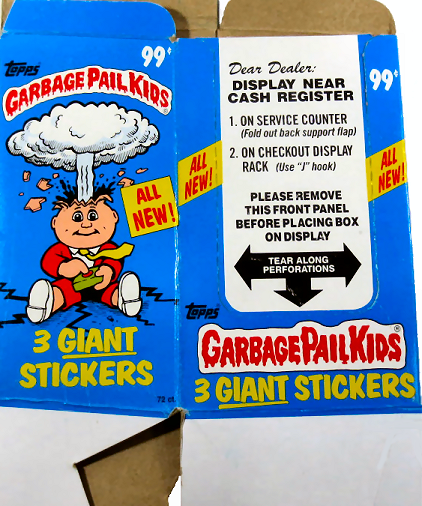 GPK'; the wrapper back only states 'Collect All 15 Stickers'. 7. 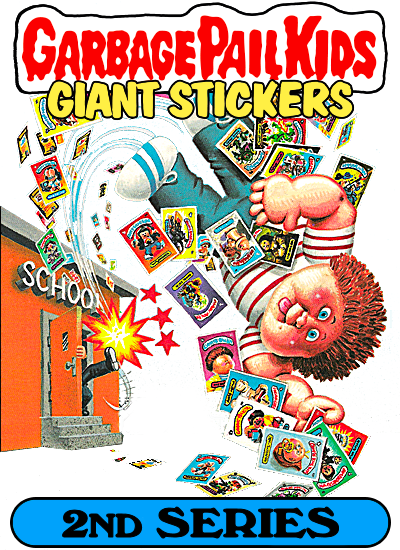 The images for all 15 Giant Sticker set can be found on Mini Giant Cards released within retail jumbo packs for the 2015 Series 2 '30th Anniversary' GPK set. The backside portrays the original card backs. The GPK logo has been replaced with a newer GPK logo and on the front side of many cards. Previously, the card front and backs were reprinted as card backs for the Flashback 1 set in 2010 for cards #1 through #12 (front) and the Flashback 3 set in 2011 for cards #12 (back) through #15. 1. Per artist John Pound's Reference Notes card #5 'HAVE A NICE DAY' and card #8 'TAKE A GPK TO LUNCH' were unpublished OS1 paintings. Card #6 'HOOKED ON GPKS' was an unpublished OS2 piece and card #7 'WHY FIGHT IT?' was an unpublished piece intended for the OS3 set. 2. 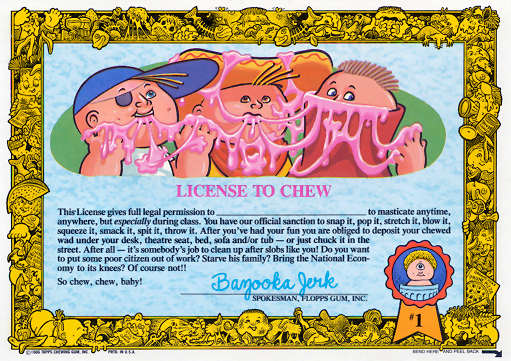 For reverse card back #1 'LICENSE TO CHEW', a 'License to Kill' phrase parody), and the remaining 14 card backs, were completed by artist Howard Cruse including the card border framing the image. The ribbon artwork with number was created and drawn by art director Mark Newgarden. 3. Two Unpublished Pieces intended for the Giant 5x7 set or GPK Poster set were titled 'MIAMI LICE', a parody of the television show 'Miami Vice', and 'E PLURIBUS GARBAGE', a GPK coat of arms parody. An unpublished award back was titled 'Creative Writing Award'. 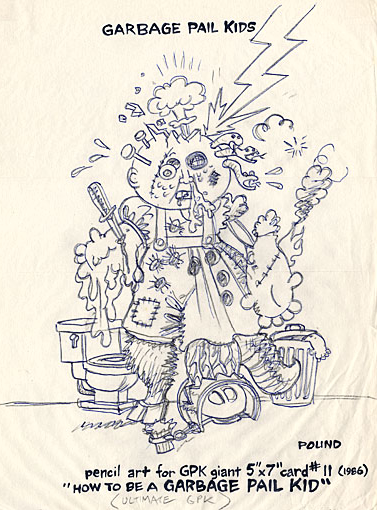 Most of the artwork pieces for the Giant GPK set are unpublished OS1 and OS2 concept pieces per art director Mark Newgarden. 4. Per artist John Pound's Pencil Artwork the character for card #11 'How to Be a Garbage Pail Kid' was originally titled (the) 'Ultimate GPK'. 5. 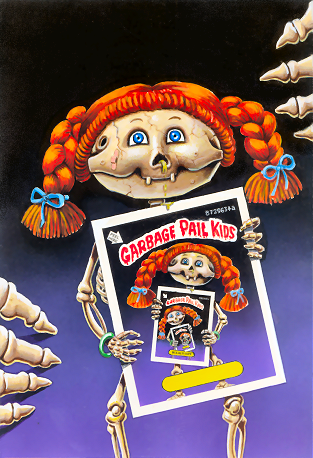 Card #3 'GARBAGE PAIL KIDS RULE' was completed by an in-house art department employee at Topps by the name of Mae Jeon. The rough and tight pencil artwork were completed by Mark Newgarden. Topps liked the security of a 'staffer' who could fill in at times of need. Only a handful of her artwork can be found including two pieces within the OS3 set based off of artist John Pound tight pencils. 8 TAKE A GPK TO LUNCH!